Orhan Pamuk is the author of seven novels and the recipient of major Turkish and international literary awards. He is one of Europe's most prominent novelists, and his work has been translated into twenty-six languages. He lives in Istanbul. "It is neither passion nor homicide that makes Pamuk's latest, My Name is Red, the rich and essential book that it is. . . . It is Pamuk's rendering of the intense life of artists negotiating the devilishly sharp edge of Islam 1,000 years after its brith that elevates My Name is Red to the rank of modern classic. . . . To read Pamuk is to be steeped in a paradox that precedes our modern-day feuds beteween secularism and fundamentalism." "Straddling the Dardanelles sits the city of Istanbul . . . and in that city sits Orhan Pamuk, chronicler of its consciousness . . . His novel's subject is the difference in perceptions between East and West . . . [and] a mysterious killer... driven by mad theology. . .Pamuk is getting at a subject that has compelled modern thinkers from Heidegger to Derrida . . . My Name is Red is a meditation on authenticity and originality . . . An ambitious work on so many levels at once." "Most enchanting . . . Playful, intellectually challenging, with an engaging love story and a full canvas of memorable characters, My Name is Red is a novel many, many people will enjoy." "Intensely exhilarating . . . Arresting and provocative . . . To say that Orhan Pamuk's new novel, My Name is Red, is a murder mystery is like saying that Dostoevsky's The Brothers Karamazov is a murder mystery: it is true, but the work so richly transcends the conventional limitations of genre as to make the definition seem almost irrelevant. . . . The techniques of classical Islamic literature are used to anchor the book within a tradition of local narrative, but they can also be used with a wonderfully witty and distancing lightness of touch . . . All the exuberance and richly descriptive detail of a nineteenth-century European novel . . . The technique of Pamuk's novel proclaims that he himself is a magnificently accomplished hybrid artist, able to take from Eastern and Western traditions with equal ease and flair . . . Formally brilliant, witty, and about serious matters . . . It conveys in a wholly convincing manner the emotional, cerebral, and physical texture of daily life, and it does so with great compassion, generosity, and humanity . . . An extraordinary achievement." book, which absorbed Pamuk through the 1990s, could conclusively establish him as one of the world's finest living writers." "A murder mystery set in sixteenth-century Istanbul [that] uses the art of miniature illumination, much as Mann's 'Doctor Faustus' did music, to explore a nation's soul. . . . Erdag Goknar deserves praise for the cool, smooth English in which he has rendered Pamuk's finespun sentences, passionate art appreciations, sly pedantic debates, [and] eerie urban scenes." "Pamuk is a novelist and a great one...My Name is Red is by far the grandest and most astonishing contest in his internal East-West war...It is chock-full of sublimity and sin...The story is told by each of a dozen characters, and now and then by a dog, a tree, a gold coin, several querulous corpses and the color crimson ('My Name is Red')...[Readers will] be lofted by the paradoxical lightness and gaiety of the writing, by the wonderfully winding talk perpetually about to turn a corner, and by the stubborn humanity in the characters' maneuvers to survive. It is a humanity whose lies and silences emerge as endearing and oddly bracing individual truths." "The interweaving of human and philosophical intrigue is very much as I remember it in The Name of the Rose, as is the slow, dense beginning and the relentless gathering of pace . . . But, in my view, his book is by far the better of the two. I would go so far as to say that Pamuk achieves the very thing his book implies is impossible . . . More than any other book I can think of, it captures not just Istanbul's past and present contradictions, but also its terrible, timeless beauty. It's almost perfect, in other words. All it needs is the Nobel Prize." "A perfect example of Pamuk's method as a novelist, which is to combine literary trickery with page-turning readability . 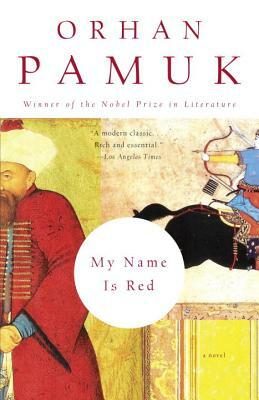 . . As a meditation on art, in particular, My Name is Red is exquisitely subtle, demanding and repaying the closest attention . . We in the West can only feel grateful that such a novelist as Pamuk exists, to act as a bridge between our culture and that of a heritage quite as rich as our own." "Readers . . . will find themselves lured into a richly described and remarkable world . . . Reading the novel is like being in a magically exotic dream . . .Splendidly enjoyable and rewarding . . . A book in which you can thoroughly immerse yourself." "A wonderful novel, dreamy, passionate and august, exotic in the most original and exciting way. Orhan Pamuk is indisputably a major novelist." "[In this] magnificent new novel... Pamuk takes the reader into the strange and beautiful world of Islamic art,in which Western notions no longer make sense .... In this world of forgeries, where some might be in danger of losing their faith in literature, Pamuk is the real thing, and this book might well be one of the few recent works of fiction that will be remembered at the end of this century."